Posted January 2, 2013 by Nate Beaty & filed under Events Archive. *VIP guests receive 5 larger chili portions throughout the night, a golden spoon and a complimentary signature cocktail. 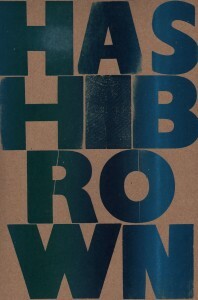 The tradition continues: On February 23rd, The Hashbrown will bring together twelve of Chicago’s finest organizations devoted to printmaking and self-publishing. Each contender in this annual competition provides a pot of chili in support of Spudnik’s mission to keep printing and publishing approachable and affordable. The 2013 chili cook-off roster includes last year’s winners, Chicago Printmakers Collaborative and The Printstitute, as well as new chefs: Homeroom, Center for Book and Paper Arts, Read/Write Library, and Chicago Alternative Comics Expo. The lineup is rounded out by Fugscreens Studios, SAIC Student Printshop, Dan Grezca, One Horse Press, SP Members and Spudnik Press will contribute a special House Chili and homemade sweet and savory tamales. “Golden Squeegee” Awards will be given for vegetarian and meat categories, determined by popular vote. In addition to warm food and comforting drinks, Spudnik’s newest acquisition, a Vandercook Letterpress, will be up and running. Spudnik’s Annex Gallery will feature a solo show of artist books by Daniel Mellis. The 2013 Collector’s Print by Kristina Paabus will be released, and the 2013 membership swag will be revealed. In less than six years, Spudnik Press Cooperative has enabled over 800 artists to create their own prints, and it has worked with as many young students through field trips and in-school youth programs. This fall, The Annex was added to better serve Chicago’s writing, comics, and zine communities. Spudnik Press Cooperative continues to increase the support they provide to Chicago’s creative community. Help Spudnik continue their mission by attending The Hashbrown, Chicago’s premier event for chili-based philanthropy.